By taking action, you will also receive periodic communications from ColorOfChange. By providing your mobile number you consent to receive cell phone and text communications from ColorOfChange and its affiliated entities concerning news and action opportunities. Message and data rates may apply. You can unsubscribe at any time by texting STOP to 225568. On Sunday, April 22, 2018, 25-year-old Chikesia “Kesia” Clemons was wrongfully arrested and dragged out of a Waffle House in Saraland, Alabama by three police officers. Kesia was waiting on a Waffle House employee to give her the District Managers information to dispute a charge when someone called the local police. A cell phone video capturing the assault has gone viral. Footage shows an officer forcing Kesia out of her chair, slamming her to the ground and exposing her breasts while two other officers wrestle with her on the floor. Internalized fear and racism is what led that person to make that phone call, which could've been fatal if it had not been for the video. Throughout the video, you can hear Kesia pleading with the officers to leave her alone because she wasn’t doing anything wrong. Once she was slammed to the ground, she asked the officer what was he doing and he responded: “I’m about to break your arm”. The video also shows another officer trying to put Kesia in a headlock by wrapping his arm around her neck, he then puts his hands around her throat to try to silence her. Chikesia was being manhandled even though she didn't pose a threat to anyone. Now Chikesia is facing two charges of disorderly conduct and resisting arrest. Calling the police on Black folks is not only dangerous but it is outright racist. The waitress who called the police on Kesia saw her as a threat and the police showed up and responded to her in the same way. There is no way it would’ve crossed the minds of those officers to treat a white woman that way, given the same circumstances. This has to end, Black women deserve to be treated with respect and dignity! I demand you drop all against Chikesia Clemons who was wrongfully arrested at Waffle House on Sunday, April 22, 2018. She posed no threat, yet officers on the Saraland Police Force slammed her to the ground, pulled down her clothing and exposed her breast. Chikesia has been traumatized enough. 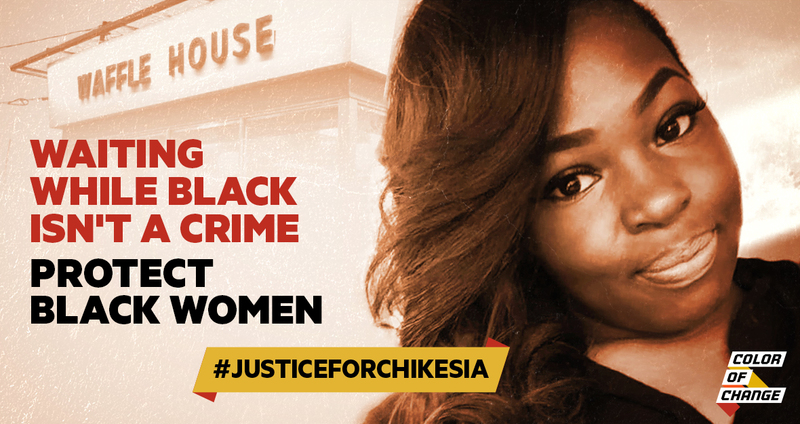 It is time for your office to end this nightmare for Chikesia by dropping all charges NOW!